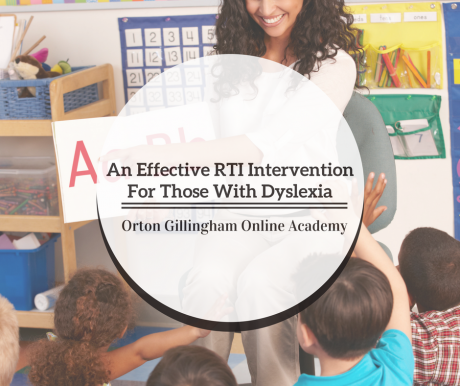 The Orton-Gillingham Approach is an effective RTI intervention for those with Dyslexia. Many of us equate children with Dyslexia as those who have intense difficulties in school. I would challenge us to be open to the notion that this may not be a result of a disability but rather an education system that uses a “cookie cutter” approach to teaching children. I have taught in many venues and all have included working with children with Dyslexia. I have watched the academic gap widen between them and their non-dyslexic peers, and I have also witnessed them soar academically given the appropriate evidence-based intervention, such as the Orton-Gillingham Approach, that has been proven effective for this diverse learning population. It is commonplace for schools to label these students with a learning disability, develop an IEP and then never really address the neurological origins of this diagnosis to provide for them interventions that cater to their learning type. Generically placing our students with Dyslexia into a category without prescriptively providing for them what they need to thrive academically often results in educational defeat. Some of our students with Dyslexia work their way through the ranks of the eligibility process; and once identified as having a learning disability that infringes upon academic success, a plan is developed. This IEP includes accommodations and modifications; however, what is often missing is the essential piece of providing them an evidence-based intervention, such as the Orton-Gillingham Approach, that will provide for them the tools to help them find optimal success in school. Children learn to read during kindergarten through the second grade. These years set the foundation for literacy skills. If our students with Dyslexia are not taught appropriately during these early years, some not only falter in school, but they are also labeled by their peers as “dumb.” We then have a group of children with average to above average intelligence with a false sense of their true intellectual capabilities. By the third grade, the academic gap widens even farther and by middle school, or sooner, many develop a learned helplessness. In a sense, they give up trying. The RTI (Response to Intervention) Model has been adopted by a vast majority of the school districts. This is a general education initiative designed to minimize referrals to special education. This model moves struggling students through tiered interventions in hopes that responsiveness to general education instruction is attained. If after moving through all three tiers, the student is still not responsive to the intervention, the eligibility process for special education is initiated. This is a wonderful model and extraordinarily effective IF the interventions used are research-based and cater to the individual needs of the students. If this condition is neglected, the RTI model is often rendered fruitless. The RTI intervention time would be a prime opportunity to deliver the Orton-Gillingham Approach to the students with Dyslexia. I have watched over and over again students with Dyslexia thrive after receiving a year or two of Orton-Gillingham instruction. These students have been spared the additional labeling and the IEP process because through effective RTI, they were completely remediated on level with their peers. 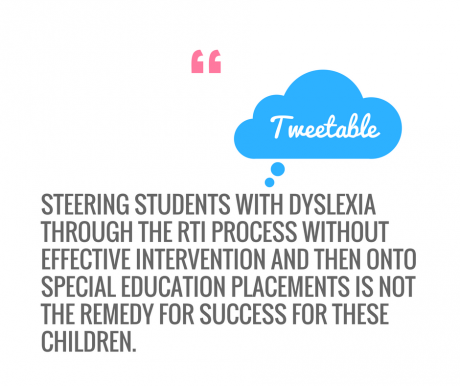 From my perspective and years of experience, steering students with Dyslexia through the RTI process without effective intervention and then onto special education placements is not the remedy for success for these children. I believe it is essential to use an evidence-based, time tested approach, such as the Orton-Gillingham Approach when teaching our students with Dyslexia. Otherwise, they may continue to struggle and labor through school no matter the placement or label they’ve been given. I will close with this thought: The rewards of optimal success and a life of productivity for our students with Dyslexia far outweigh the small price the schools would need to pay for Orton-Gillingham training. The “cookie cutter” approach to education does not work for many of our students. Perhaps we should let go of the mold and become more pliable for the sake of our students.